I know most of you already know how to make hot oatmeal for breakfast. I’ve been doing it since I was a kid. Over time, I’ve developed my own superfast method for getting it out of the box and into my mouth as quickly as possible. Try my way once, and then of course, go back to your own way. I don’t think you will. First of all, I keep a salt shaker of pure cinnamon close to the stove. It’s right next to the un-refined Sonoran Desert Honey in a squirt bottle, and the olive oil in an oil dispenser. I have an inexpensive non-stick pan with a glass lid as my oatmeal pot along with a wooden spoon. (just a bit old fashioned) I have, on the occasion some other cook in the house used my OATMEAL POT, used a non-stick frying pan that has a lid. Add an eyeful (maybe 3 heaping tbls.) of your favorite granola de jour. Last week at the ‘Sprouts’ farmers market, they had Almond/macaroon on sale for 2.99/lb., so that’s what I’m using this week. My other favorite is Vanilla/Pecan. I keep it in a cashew container nearby. Now cover, stir, put it on the burner and heat until it is gently boiling, plop, plop, plop, stir. Move it off the burner still covered. While it’s steeping, go get a wide shallow cereal bowl, some whole milk (it doesn’t look anemic and tastes like cream), and pause a bit. When you can’t stand to wait anymore, empty the oatmeal/granola into your bowl, and squirt a thin band of honey criss cross on the top (it doesn’t take much). Poor the milk carefully around the edge of the hot cereal until it covers the whole top without disturbing the cereal. Use your favorite breakfast spoon, and dip toward you so that you get cereal and milk up against the cereal bowl. Rotate the bowl as you spiral your way through to the last spoonful. Occasionally, you may run a little short of milk, and it’s ok to add a tad more to complete the balance properly. An alternative is finely chopped chilis from a jar. I make 1/2 of this recipe at a time to keep it fresh. All of the added ingredients may be added short, and brought up to your taste! I like a little extra hot sauce! burn it, stirring until it is creamy. Do not simmer. Let it cool enough to transfer to a jar or container. on a hamburger off the grill or hot burrito. Bread made with honey has a slightly nutty flavor that cannot be found in bread made with sugar. 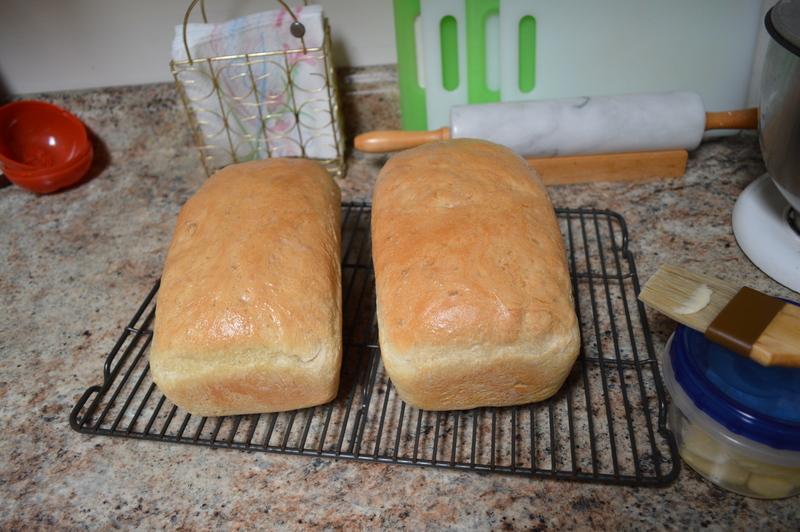 This bread is easy for beginners and experienced bakers alike! One large mixing bowl, I use the big yellow Tupperware one with the cover. That’s it! Beginners follow these instructions line by line. Mix the flour, salt and yeast in the mixing bowl. Add the egg, olive oil, honey, and water until everything is damp and in a ball. Knead for 1 minute in the bowl. Less is ok….add a little flour if it’s too sticky. It should be a fairly firm dough. Bake at 350° for 34 minutes Remove the loaves from the pans and place them on cooling a rack. In a medium bowl (I use aluminum because it conducts heat a little faster) add 4 cups of Bread flour, 1 1/2 tsp. of salt. (I’ve been known to add garlic salt instead of salt) I blend these with a wire whisk. Add in the started yeast (foam will begin to form on the top) and mix with a fork or pastry blending tool. Knead into a bread dough ball and rub with olive oil. Put it back in the same bowl. Now put almost hot water in a slightly smaller bowl (any material), and set the dough ball bowl on top of the warm water bowl. I cover this with a damp flour sack towel to keep it moist and warm. Let it rise, punch it down, put fresh warm water in the bottom bowl and let the pizza dough rise again. While the dough is rising, dice 3/4 cup of onion, and 3/4 cup of green pepper and caramelize them in a medium fry pan. When they are translucent, remove them and brown to crumbling the pork sausage. When that is browned, add the onion and pepper back in and cover off of the heat. Let it set until needed. When the dough has risen twice, flour your rollout surface and dump the dough ball in the middle of the flour and then work it a bit to develop the gluten. I then slowly roll it out with my heavy roller (marble). I try not to stretch it but want the round to be an inch bigger than the 16″ pan or 18″. I then perforate it all over with a fork to prevent large bubbles. Place the dough on the pizza pan and let it rest and raise a little. Now, there are two ways to go. Fold the dough under and make it look good, or brush pizza sauce on the top edge, add a trail of mozzarella all the way around the pizza, and roll the extra hang over dough to make a stuffed crust ring all the way around. Now I brush the garlic butter or salt on the rolled part. Pre-heat the oven to 400°. Next spread the pizza sauce on the rest of the pizza, and add the pork sausage, onion, and green pepper crumbles. Sprinkle on the parmesan cheese and Italian seasoning, spread the pepperoni around about two inches apart. Now add the mozzarella to cover the surface well. Now, I add 8 to 12 pepperoni slices on top because the grease from the pepperoni darkens the mozzarella cheese and I like the mozzarella dark. for taste. At this point, you can let the pizza rest or put it in the oven on the 2nd shelf down from the top. Set the timer for 20 minutes and begin to watch it. No two ovens are the same. If the top is getting done before the crust is getting brown on the bottom, move the pizza down. Find the best spot for your oven and remember it. 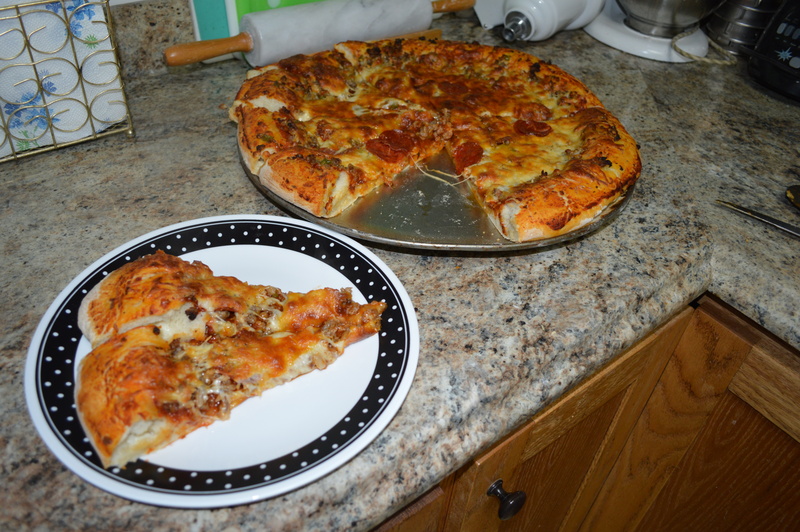 When the pizza is done, let it rest long enough to firm up…..slice and enjoy. If there was ever a great left over breakfast pizza, this is the one! It’s got breakfast sausage in it! !